Background: Intravenous injection or topical application of tranexamic acid during total hip arthroplasty has been shown to effectively reduce blood loss. There is no consensus on differences in clinical efficacy and safety between these two administration methods. To determine the optimal clinical efficacy of tranexamic acid during hip replacement, we will compare differences between these two administration methods during total hip arthroplasty. Methods/Design: The study protocol is a prospective, paired (1:1:1), double-blind, randomized controlled clinical trial. A total of 174 patients who will receive hip replacement at Ruijin Hospital, Shanghai Jiao Tong University, China will be randomly divided into three groups, with 58 patients per group. Before the end of surgery, in the placebo group, 60 mL of physiological saline will be used to soak the articular cavity for at least 3 minutes and then be sucked away; in the topical tranexamic acid group, 60 mL of physiological saline containing 3 g tranexamic acid will be used and then sucked away; in the intravenous tranexamic acid group, 100 mL of physiological saline containing 10 mg/kg tranexamic acid will be intravenously administered 15 minutes before surgery and then again 3 hours later. The primary outcome is total blood loss on postoperative day 3, which is calculated using Nadler's and Gross's formula. Secondary outcomes include blood transfusion rates, drainage output within 2 days postoperation, amount of human serum albumin used during hospitalization, postoperative blood coagulation indices, and incidences of deep venous thrombosis and other thromboembolic events during postoperative day 1-week 6. Discussion: This protocol is powered to provide reference information for the rational use of tranexamic acid by comparing clinical efficacy of the drug between intravenous and topical administration routes. Trial registration: ClinicalTrials.gov identifier: NCT02312440; registered on 28 November 2014. Ethical approval: This study protocol was approved by the Ethics Committee of Ruijin Hospital, Shanghai Jiao Tong University, China (permission No. (2014)-47-2) and will be performed in accordance with the Declaration of Helsinki. Total hip arthroplasty is a main surgical method to treat hip-joint diseases. In addition to the complications of femoral head replacement, other complications include postoperative anemia, acetabular prosthesis loosening and dislocation, and local response after wearing of the ultra-high-molecular-weight polyethylene surface in the loading area. 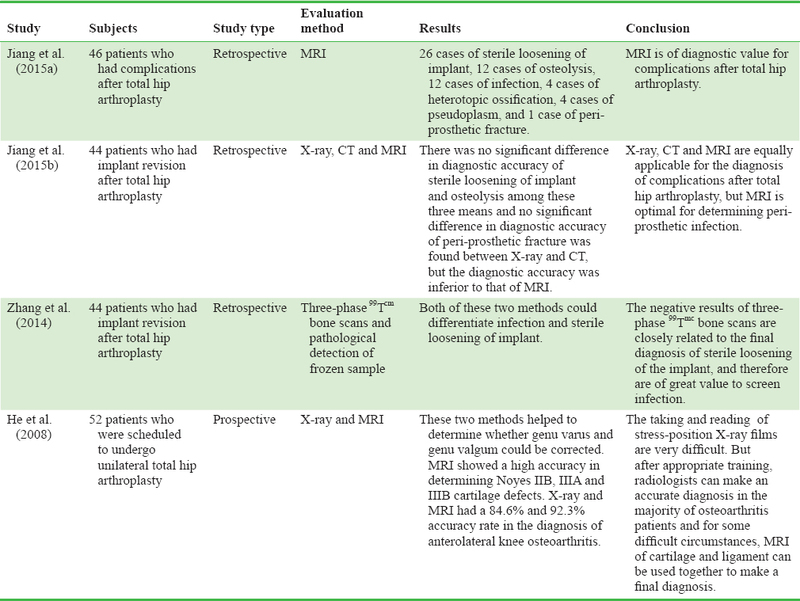 We have systematically studied the complications of total hip arthroplasty and the imaging methods used for their diagnosis [Table 1] (He et al., 2008; Zhang et al., 2014; Jiang et al., 2015a, b) and strengthening perioperative management is very important for increasing the clinical efficacy of total hip arthroplasty. Intraoperative blood loss and postoperative anemia are very common symptoms and also key management aspects in the perioperative period of total hip arthroplasty (Sprigg et al., 2014; Gregersen et al., 2015; Sizer et al., 2015; Wong et al., 2015). Approximately one third of patients undergoing total hip arthroplasty need allogeneic blood transfusion. However, allogeneic blood transfusion is used with caution because of possible disease propagation, immunosuppression and transfusion reaction (Spahn, 2010). Therefore, there is a need to develop a new method to replace or reduce blood loss in the perioperative period of total hip arthroplasty. Tranexamic acid is mainly used to treat hemorrhage caused by acute or chronic, local or systematic hyperfibrinolysis (Röggla and Jilma, 2014; Aguilera et al., 2015). It is often used to treat surgical hemostasis and its overdose can lead to thrombosis, hemorrhage, whole-body spasm and kidney disease (Banerjee et al., 2013; Sprigg et al., 2014; Ker et al., 2015). A meta analysis has shown that intravenous tranexamic acid can greatly reduce blood loss without concerns of deep venous thrombosis and pulmonary thrombosis (Wei and Liu, 2015). There is no consensus for its precise clinical efficacy and safety issues. To acquire the optimal administration route and clinical efficacy of tranexamic acid during total hip arthroplasty and to develop a safer and more effective hemostasis protocol, we designed a study protocol for prospective, paired (1:1:1), double-blind, randomized controlled clinical trials that compares the hemostatic effects and safety of tranexamic acid between intravenous and topical administration routes. This protocol will provide evidence for the rational use of tranexamic acid in the peri-operative period of total hip arthroplasty. A prospective, paired (1:1:1), double-blind, randomized, controlled clinical trial. This protocol was approved by the Ethics Committee of Ruijin Hospital, Shanghai Jiao Tong University, China (permission No. (2014)-47-2). Sixty patients who will be scheduled to undergo total hip arthroplasty for the first time in the Department of Orthopedics, Ruijin Hospital, Shanghai Jiao Tong University, China will be included in this study. Written informed consent should be obtained prior to involvement in the clinical trial. The patients involved in this study protocol should meet the following criteria. The entire process of the double-blind clinical trial will be arranged and controlled by the designers, Jian-min Feng and Kai-di Zhou. One day prior to surgery, all patients will be randomly divided into groups using computer generated random numbers and the same researcher will inform the patients via mobile phone according to group management. The pharmacists who will not participate in the clinical trial will prepare the drug according to advice for each patient. Physiological saline or tranexamic acid will be prepared by assistant nurses and then injected into the articular cavity by surgical physicians. Tranexamic acid will be intravenously administered by the anesthetists who will not participate in the clinical trial. All patients included in the treatment and evaluation, physicians and nurses will be temporarily designated to each group and all of them will not know the group management. All nursing personnel and data analyzers will be randomly assigned. The researcher who will evaluate whether patients will be scheduled to undergo total hip arthroplasty and will be included in this clinical trial on the second day and the names of the patients who have signed informed consent will be given to another researcher. A total of 174 patients will be randomly and evenly divided into three groups using a 1:1:1 paired method. Before the end of surgery, in the placebo group, 60 mL of physiological saline will be used to soak the articular cavity for at least 3 minutes and then be sucked away; in the topical tranexamic acid group, 60 mL of physiological saline containing 3 g tranexamic acid will be applied and then sucked away; in the intravenous tranexamic acid group, 100 mL of physiological saline containing 10 mg/kg tranexamic acid will be intravenously administered 15 minutes before surgery and then again 3 hours later. Four surgeons will be responsible for hip operations using an anterolateral approach. All patients will undergo acute hypervolemic hemodilution and controlled hypotension during anesthesia. All patients will orally take 10 mg rivaroxaban tablets for anticoagulation for 15 days post-surgery. After surgery, cephalosporin will be used to prevent infection and clindamycin will be used when patients are allergic to cephalosporin. All patients will inform the researchers about their discomforts, who will be responsible for safety reports, and the last follow up will be at postoperative week 6. Blood coagulation: including activated partial thromboplastin time, thrombin time, prothrombin time, international normalized ratio, fibrinogen, fibrin degradation product, and serum level of dimer. The inhibitory effect of tranexamic acid on hyperfibrinolysis can be determined according to these blood coagulation indice The timing of trial outcome evaluation is shown in [Table 2]. The required trial information will be transcribed from medical records by two researchers, once per month. The transcribed trial data will be dated and uploaded to the designated computer for later use. A data table will be created by the researcher responsible for group assignment. When all participants have been followed up, the two tables will be rechecked and a password will be designated by the primary researchers, drug registration applicant, statistician and the researcher who devised the group assignment method. The database containing the two tables will not be changed and will be saved for later referral. Group assignment will be accessible for the first time. The placebo, intravenous tranexamic acid, and topical tranexamic acid groups will be replaced with groups A, B and C. The database will be statistically analyzed by the statistician and group assignment will be accessible for the second time. Sample size will be calculated using PASS 14.0 software. Based on the outcomes from Gomez-Barrena et al. (2014), it is hypothesized that topical tranexamic acid has non-inferiority compared to intravenous administration. If β ≤ 0.1, power = 90%, significance level α = 0.025 (one-sided), then sample size n = 51 per group can meet the clinical efficacy of non-inferiority. It is estimated that 20% of the sample size will be lost, and an approximate sample size n = 60 per group will be needed, and a sample size n = 58 per group will be used. SAS 8.0 software (SAS, Cary, NC, USA) will be used for data analysis. The normally distributed measurement data will be expressed as the mean with standard deviation and minima and maxima. The non-normally distributed measurement data will be expressed as q1, median and q3. The numerical data will be expressed as the constituent ratio. Fisher's test will be used to compare numerical data between groups. When homogeneity of variance occurs, the normally distributed numerical data will be tested using one-way analysis of variance; when heterogeneity of variance occurs, the normally distributed numerical data will be tested using Tamhanes T2 test. The non-normally distributed numerical data (q1, median and q3) will be tested using the Kruskal-Wallis rank sum test. The normally distributed measurement data (drainage output, total blood loss, amount of human serum albumin used, and blood coagulation indices) will be tested using one-way analysis of variance and Bonferroni correction. The chi-square test will be used to test the differences in safety indices and blood transfusion rate between groups, with a significance level α = 0.05 (two-sided). The Ethics Committee of Ruijin Hospital of China will be designated to temporarily evaluate the trial safety and to ensure the integrity and validity of recorded data. All adverse events should be recorded and severe adverse events should be reported within the designated time and recorded. The trial will be terminated if the risk of thromboembolic events increases in patients after the use of tranexamic acid. Participant recruitment at time of submission. JMF and KDZ designed this trial protocol, collected data, wrote the paper, and approved the final version of this paper. HYW, YFY and WXH also participated in trial design and conduction. All authors approved the final version of this paper. Aguilera X, Martínez-Zapata MJ, Hinarejos P, Jordán M, Leal J, González JC, Monllau JC, Celaya F, Rodríguez-Arias A, Fernández JA, Pelfort X, Puig-Verdie Ll (2015) Topical and intravenous tranexamic acid reduce blood loss compared to routine hemostasis in total knee arthroplasty: a multicenter, randomized, controlled trial. Arch Orthop Trauma Surg 135:1017-1025. 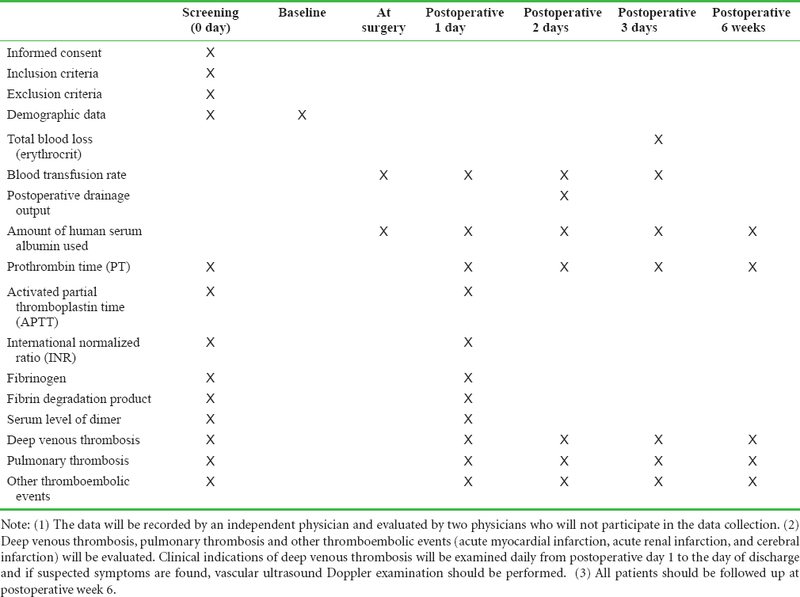 Banerjee S, Issa K, Pivec R, McElroy MJ, Khanuja HS, Harwin SF (2013) Intraoperative pharmacotherapeutic blood management strategies in total knee arthroplasty. J Knee Surg 26:379-385. Gomez-Barrena E, Ortega-Andreu M, Padilla-Eguiluz NG, Perez-Chrzanowska H, Figueredo-Zalve R (2014) Topical intra-articular compared with intravenous tranexamic acid to reduce blood loss in primary total knee replacement: a double-blind, randomized, controlled, noninferiority clinical trial. J Bone Joint Surg 96:1937-1944. Gregersen M, Borris LC, Damsgaard EM (2015) Postoperative blood transfusion strategy in frail, anemic elderly patients with hip fracture: the TRIFE randomized controlled trial. Acta Orthop 86:363-372. Gulati Y, Sharma M, Bharti B, Bahl V, Bohra I, Goswani A (2015) Short term results of cementless total hip arthroplasty in sicklers. Indian J Orthop 49:447-451. Hamlin BR, DiGioia AM, Plakseychuk AY, Levison TJ (2015) Topical versus intravenous tranexamic acid in total knee arthroplasty. J Arthroplasty 30:384-386. He C, Yang QM, Feng JM, Lu Y (2008) Comparison of MRI versus stress radiograph in imagiological diagnosis of the anteromedial osteoarthritis knees. Zhongguo Jiaoxing Waike Zazhi 21:1601-1604. Jiang MH, He C, Feng JM, Chen Z, Yan FH, Lu Y (2015a) MRI findings of common complications following hip arthroplasty. Zhonghua Fangshexue Zazhi 49:126-129. Jiang MH, He C, Feng JM, Yan FH, Chen Z, Lu Y (2015b) X-Ray, CT and MRI diagnoses of complications with hip arthroplasty. Zhongguo Yixue jisuanji Chengxiang Zazhi 21:278-282. Ker K, Roberts I, Shakur H, Coats TJ (2015) Antifibrinolytic drugs for acute traumatic injury. Cochrane Database Syst Rev 5:CD004896. 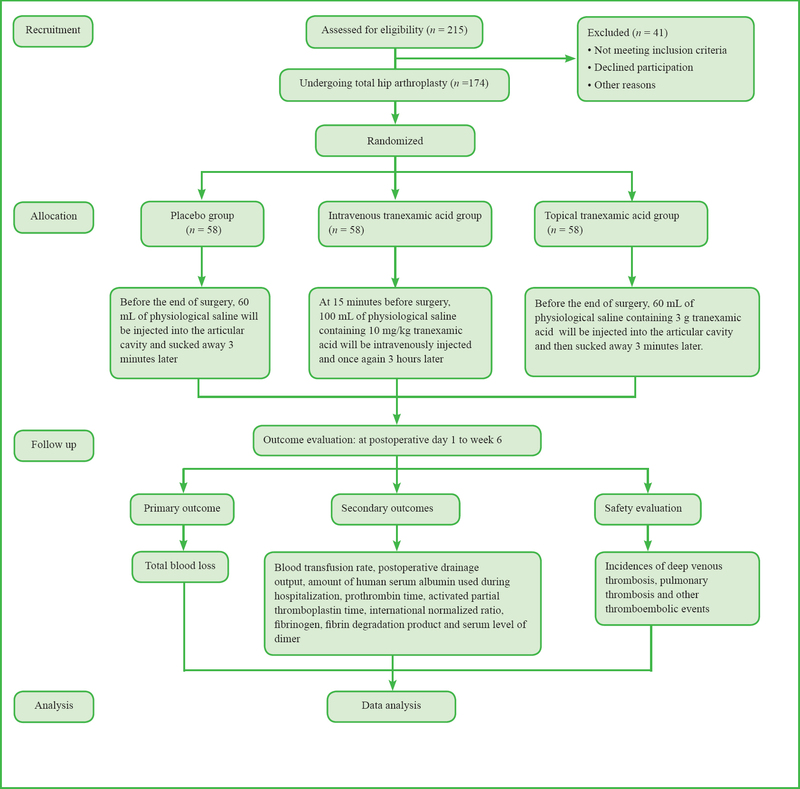 McCormack PL (2012) Tranexamic acid: a review of its use in the treatment of hyperfibrinolysis. Drugs 72:585-617. Nadler SB, Hidalgo JH, Bloch T (1962) Prediction of blood volume in normal human adults. Surgery 51:224-232. Schwameis M, Thaler J, Schober A, Schörgenhofer C, Kulinna-Cosentini C, Laggner A, Röggla M, Jilma B (2014) Tranexamic acid and fibrinogen restore clotting in vitro and in vivo in cardiac thrombus associated hyperfibrinolysis with overt bleedings. Thromb Haemost 112:1071-1075. Sizer SC, Cherian JJ, Elmallah RD, Pierce TP, Beaver WB, Mont MA (2015) Predicting blood loss in total knee and hip arthroplasty. Orthop Clin North Am 46:445-459. Spahn DR (2010) Anemia and patient blood management in hip and knee surgery: a systematic review of the literature. Anesthesiology 113:482-495. Sprigg N, Renton CJ, Dineen RA, Kwong Y, Bath PM (2014) Tranexamic acid for spontaneous intracerebral hemorrhage: a randomized controlled pilot trial (ISRCTN50867461). J Stroke Cerebrovasc Dis 23:1312-1318. Wei Z, Liu M (2015) The effectiveness and safety of tranexamic acid in total hip or knee arthroplasty: a meta-analysis of 2720 cases. Transfus Med 25:151-162. Wong S, Tang H, de Steiger R (2015) Blood management in total hip replacement: an analysis of factors associated with allogenic blood transfusion. ANZ J Surg 85:461-465. Zhang J, Wang Y, Feng JM, Song YY, Liu ZH, He C (2014) Intraoperative frozen section analysis and 99Tcm triplephase bone scanning for diagnosing periprosthetic infection in hip. Zhongguo Zuzhi Gongcheng Yanjiu 18:4921-4928. 1 Commentary on "clinical efficacy of tranexamic acid administration via different routes during total hip arthroplasty: study protocol for a prospective randomized controlled trial"